Watch full One Piece Season 14 Episode 48 English Dubbed full HD online. One Piece Episode 506 English Dubbed online for free in HD. On Kuraigana Island, Zoro confronts and is nearly defeated several Humandrills, but is stopped by Mihawk. 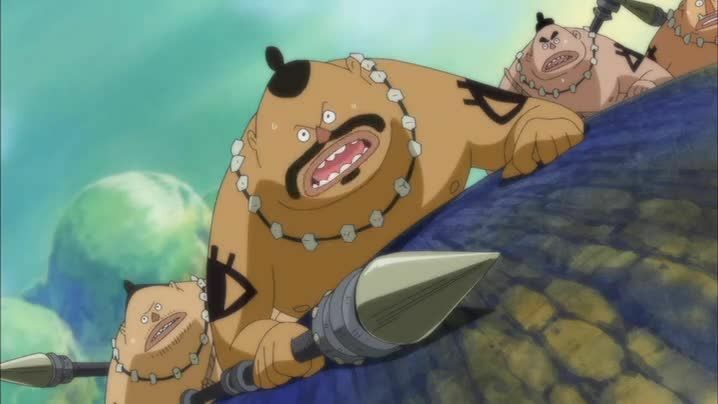 On Birdie Kingdom, Chopper is captured by a human tribe and attempts to escape, but is stopped by the giant birds. Eventually, the tribe befriends the birds and Chopper before he receives the newspaper about Ace’s fate. On Weatheria, Nami is working hard labor when she also receives the newspaper. On the Bowin Island, Usopp has become overweight despite Heracles’ objections and knocks down a News Coo with a newspaper. On Kamabakka Kingdom, Sanji has become a crossdresser and watches the sunset; he receives the newspaper and becomes horrified about Ace’s death. On Tequila Wolf, Robin decides to see her friends. Meanwhile, on Baldimore, Franky remembers that he defeated a mechanical polar bear after finding a stash of cola, before a fax machine prints out a newspaper about Ace’s death. At Hungaria, Brook is writing music for the Longarm Tribe when he loses his concentration and discovers Ace’s death. Back on Kuraigana Island, Zoro tells Mihawk that Kuma teleported him, and Mihawk informs Zoro of Ace’s death.